六壬 Liù-Rén is one of 古三式 the Three Ancient Boards, which become the mainstream of divination techniques after 秦朝 the QÍN Dynasty (246BCE to 206BCE). The origin of Liù-Rén can be traced back to as early as 周朝 the ZHŌU Dynasty. A few ancient Liù-Rén examples were found in 《吳越春秋》 the Spring and Autumn Annals of WÚ and YUÈ by 趙曄 ZHÀO Yè of 東漢 the Late HÀN Dynasty. Liù-Rén features the integration of the ancient Chinese version of Local Apparent Sidereal Time (LAST in short, denoted as θ) and the Day of Divination. Based upon which, 六壬課 a Liù-Rén Setting consists of the LAST Chart, 四課 the Four Pillars and 三傳 the Three Derivatives. LAST, also known as 月將加時 Yuè-Jiāng jiā Shí in Chinese astrology, which is mathematically equivalent to the addition of the Right Ascension (denoted as α) and Time (denoted as H) in terms of hours, is essentially the Natal Chart in western astrology. Introducing the origin of Liu-Ren. Introduces the Chinese calendar and how it applies in Liu-Ren, especially the Chinese interpretation of Local Apparent Sidereal Time (LAST). Describes those Wu-Xing properties that are mostly applicable in Liu-Ren. 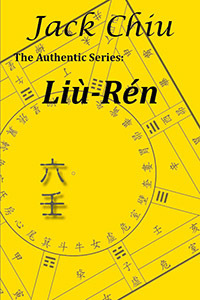 Describes the basic principles and the Nine Rules of Liu-Ren Setting. Introduces the reading skills of Liu-Ren, and highlights with real life examples. This book is written for people who were searching for an easy and rational way of learning Liu-Ren.